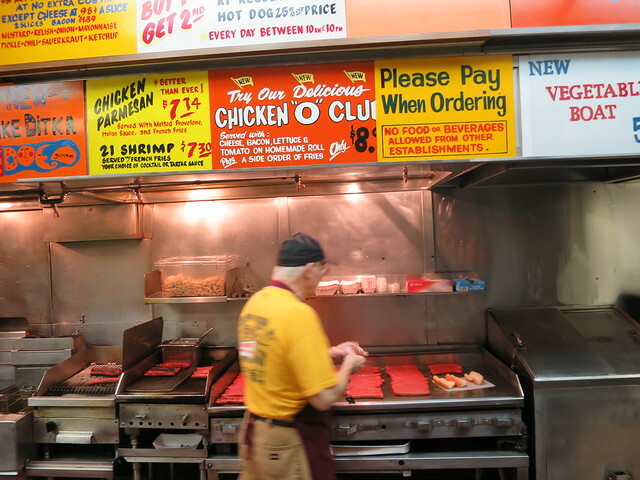 While figuring out what was good for a recent trip to Pittsburgh it became apparent that many old school hot dog shops were going to be within reach. 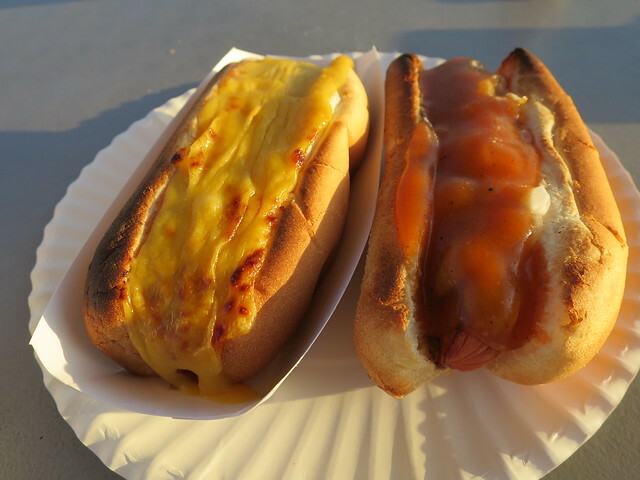 It started with a google of what was good foodwise in New Castle which led me to some propaganda about the town being the "hot dog capital of the world." That's a bold claim especially to someone from Chicago. I can tell for fact that it's also a laughable statement. What they do have though is their own style of chili and it's one that's as unique as any I've ever had. 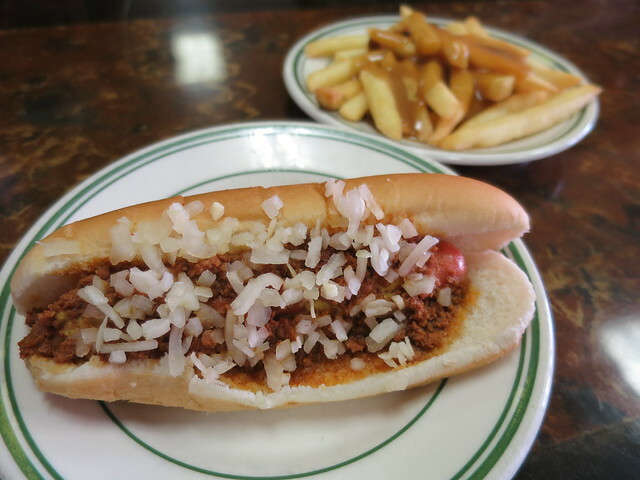 But it doesn't stop there pretty much every town has a longstanding hot dog shop and all of them feature a housemade chili that's a standard topping for locals and it's usually topped with mustard and onions. Away we roll. This is the only spot I found in these parts that labels itself as a Coney Island style hot dog stand. 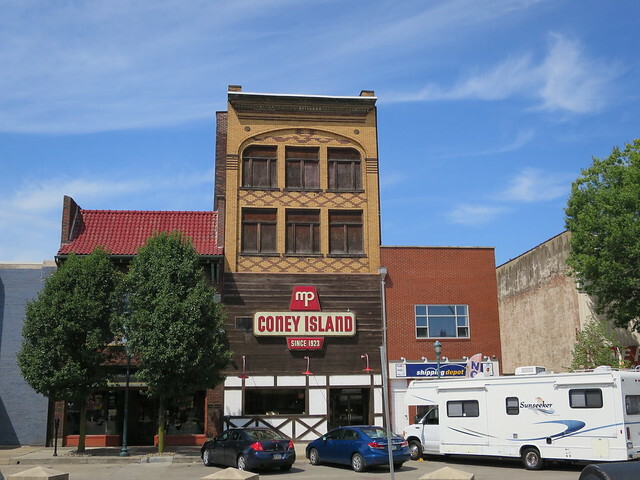 It sits in a beautiful old building in a picturesque part of town as far as old school Americana goes. The sign outside reads since 1923 so this would make it one of the older Coney Island Hot Dog shops in the country though not the oldest. 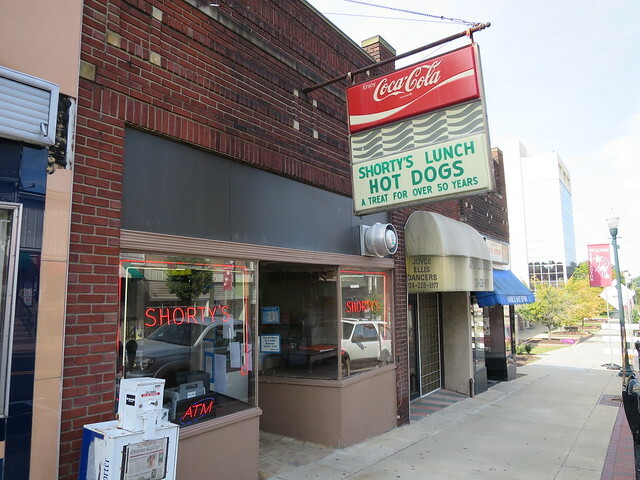 I didn't snap an inside pic but the cheap wieners are sitting on a flattop in the window and it's pretty bare and somewhat dungy inside, thus it had the feel of a real deal Coney joint. Where they weren't a good representation of them was in the service. The yocals working were abysmal at their simpleton job. Stay off the meth kids. Hot dogs are like $1.09 each so you know the smaller sized tubed meat was cheap. However the sauce was indeed very interesting. It glistens. Most certainly a style all its own with a real nice spice kick to it. 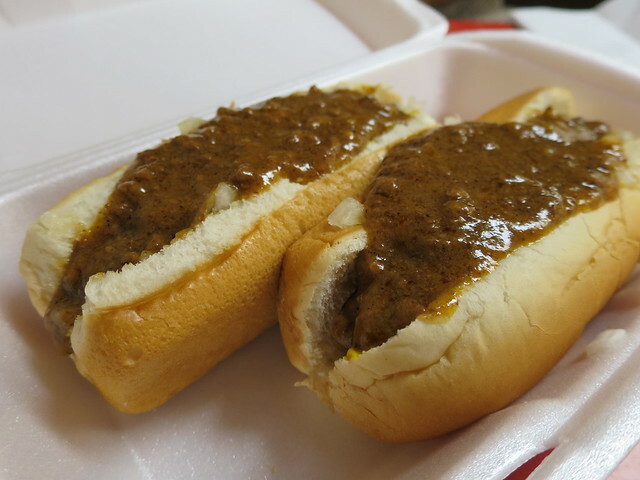 There's a few spots to get these New Castle style chili dogs and PO Lunch sounded like one worth trying. 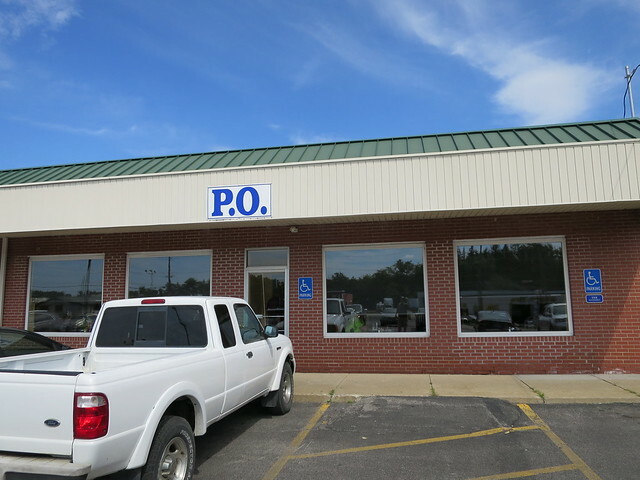 Its named that because it's the old town Post Office or something like that. 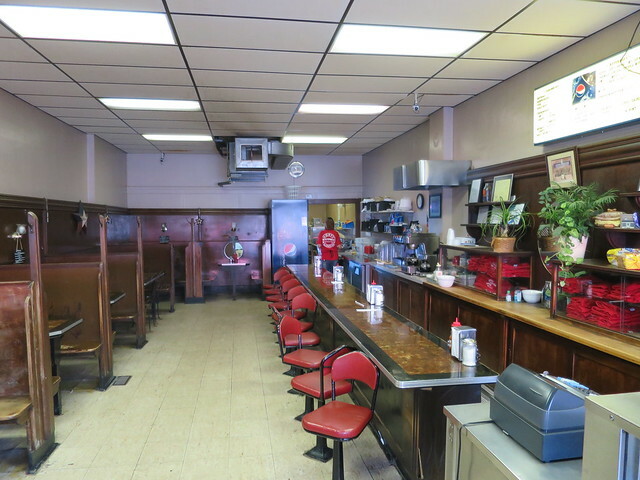 It's more of a diner than a hot dog counter but the chili dogs are the most ordered thing on the menu. I thought these were better than MP because the wieners were porkier with some actaula snap and it was assembled better than the first stop. The chili was damn good but I do think MP's was a bit better as they had some real spice to tingle the tongue while PO's were pretty tame in that department. There's some recipes online for this style of chili and I may have to give one a try this football season. 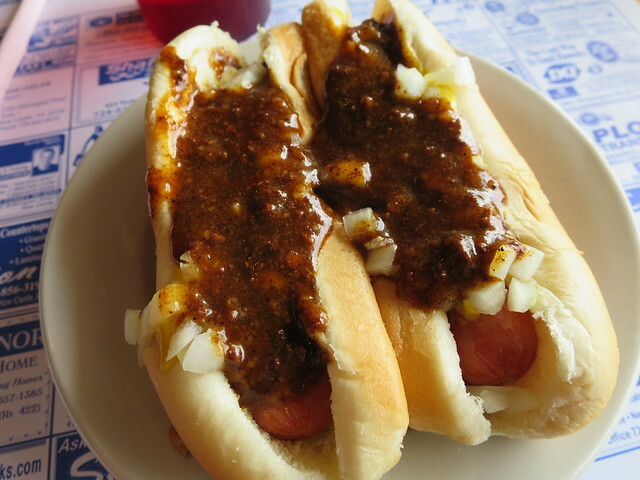 As far as New Castle being the Hot Dog Capitol of the world, no, the capitol of Western Pennsylvania? Sure. Overall this might've been my favorite spot. It sat on an all-American type Main street and a hot dog with a side of gravy fries made for a great breakfast. Notice how chili dogs are just called hot dogs in these parts. Chili is pretty much a standard topping. Shorty's made a great blend and used those little rehydrated onions. The wiener was cheap but these were like little hot dog sliders. The fries with gravy were comforting and I regret not trying a roast beef sandwich. It looked good sitting in its own juices next to the unique old school griddle the wieners were sitting on in front of the window. They don't make 'em like this anymore. jimswside found this one famous for footlongs that we took a ride to after Shorty's. 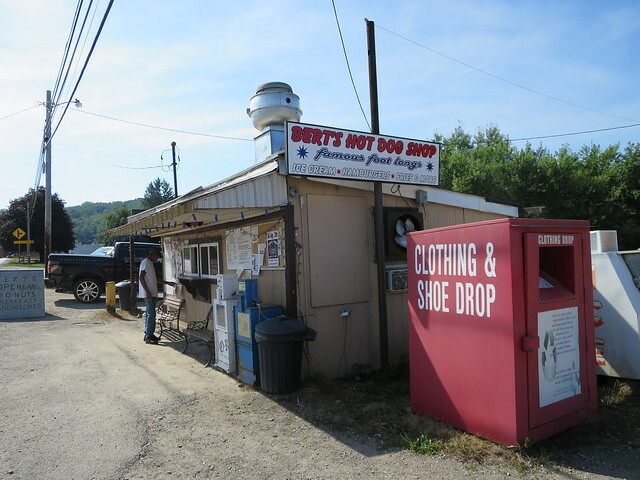 It's been a roadside eat for truckers, bikers, cops, and all others for over 60 years. There is no seating inside as it's a walk-up shack. 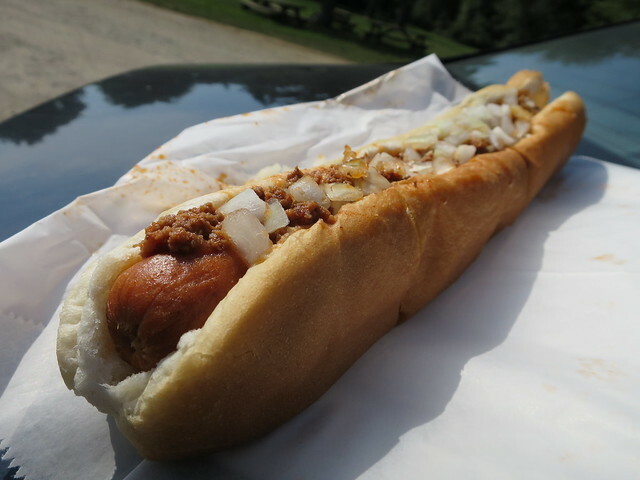 The feature foot long included chili and ketchup which didn't sound too appealing to me so we just split one with chili, mustard, and onions. As would become the norm the chili was the best part. It's an all meat blend here. I can see why it's "rural famous". However important to mention again that the wieners are not top of the line. 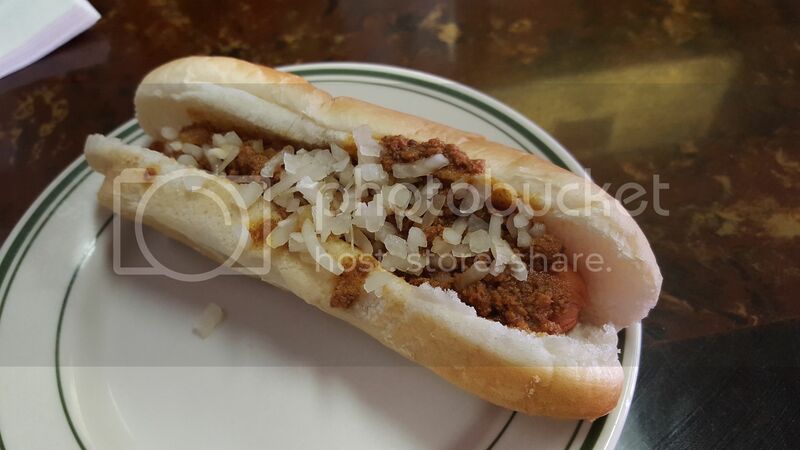 Hot Dog with Sauce, Mustard, Onion. Plus one same thing with cheese. 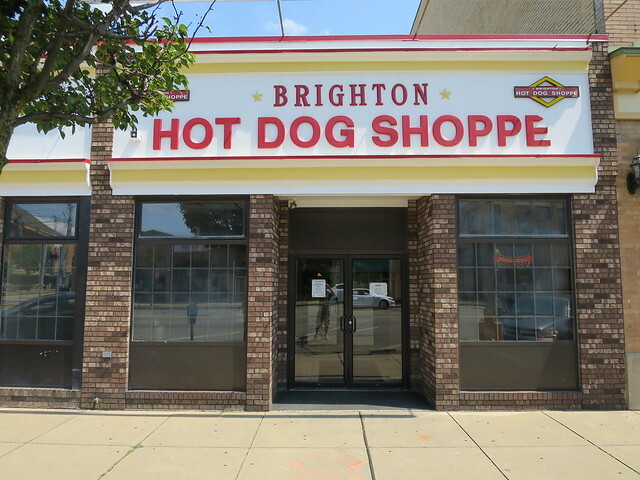 We missed a few spots closed on Sunday's but the original Brighton Hot Dog Shoppe was open so we cruised thru this odd town for a hot dog. I think there's a coo coo house nearby. This is a mini chain going back to the mid 60's. The dogs are again, average at best, and the sauce was again good. Most of these places sell the chili dogs for no more than a dollar and change so they're cheap fast snack most people in town grew up on. 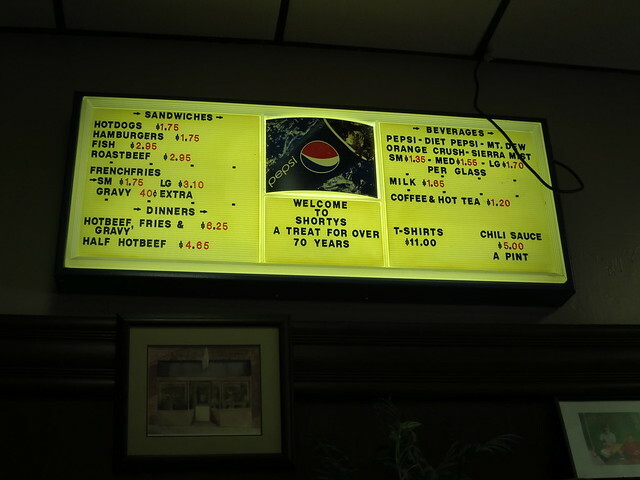 The dogs here aren't cheap, and neither are the famous fresh cut fries. 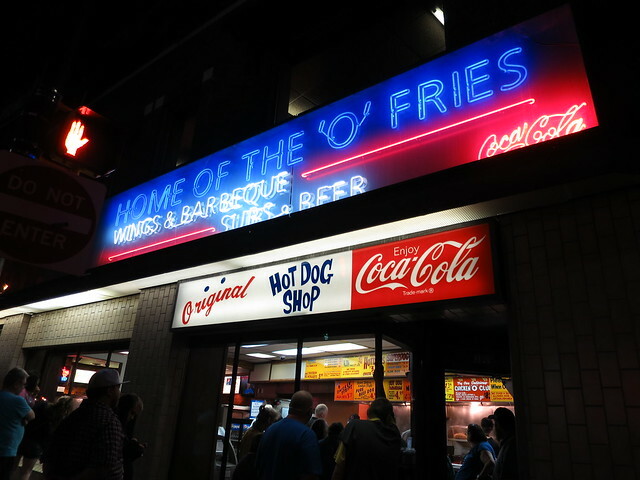 In fact a hot dog and fries will cost you about $10 so it's much more than Chicago folk are used to paying for a natural casing wiener and some fresh cut fries. A small fries feeds like 3-4 people and I've had plenty of good fresh cut fries which these looked to be but I passed opting to save stomach space. 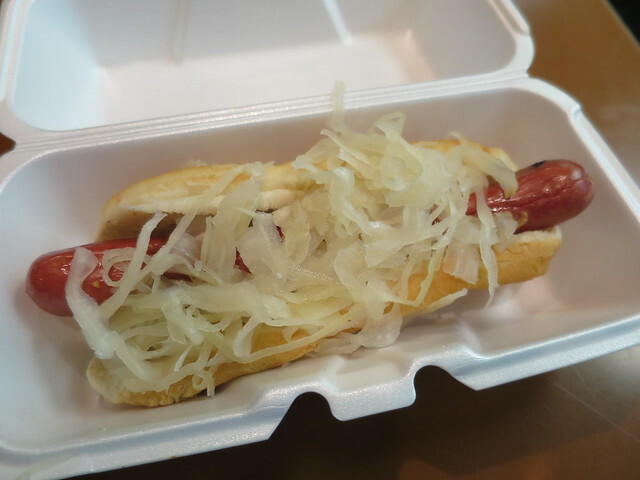 The wiener itself was most certainly the best quality on this trip and one grilled with sauerkraut and onion was very good but I'll still take the minimalist style we got going on over here. They do offer chili here and I heard it was good but I wanted a kraut dog so I passed on trying a chili dog. There's also beer and cheesesteaks. Fun stop. 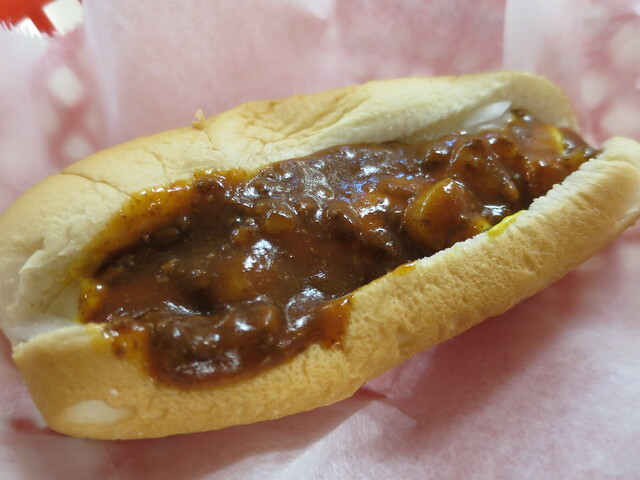 Never knew the area was such a hot bed for chili dogs before researching the trip. I liked every stop. 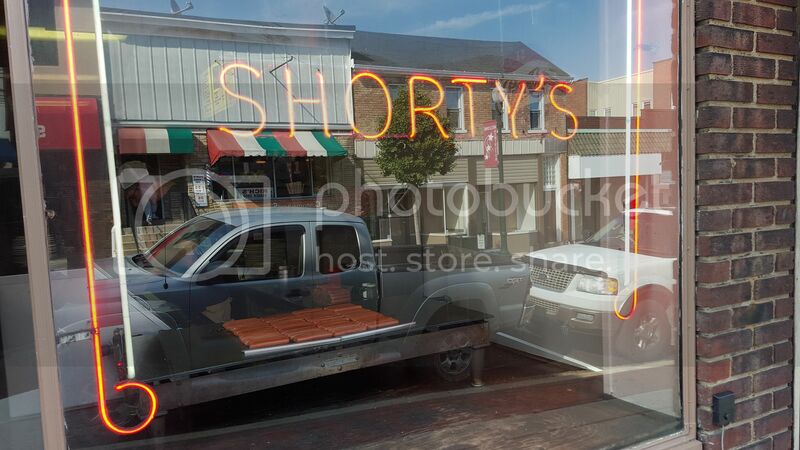 Shorty's - could easily make this a stop a couple times a week if I lived anywhere close. 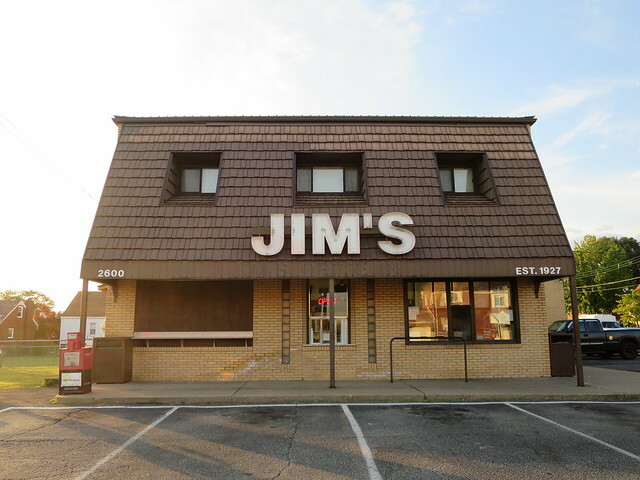 Jim's Famous sauce was on both of our short lists - got stuck in a wicked traffic jam on our first try to go there on Sat. AM, glad we worked our way back out there later in the day once things cooled off - Really liked those dogs. You guys do the coolest road trips. Well done. BUT: you gave the O short shrift, you really did! I've served lots of time at U. Pitt, which means that I've served lots of time sitting around the O, chowing down. The dog is not just natural casing, it's *lambskin* natural casing. Their chili is a world-beater. And those are some of the best fries on the East Coast. And did you note the line up of beers on draft?! I think you need to give the O a mulligan! PS. BTW, did you get hold of Sazerac while you were in Pgh? ?